Le Violon d’Lisa illustrated my struggle as a woman in a society that I was raised in. 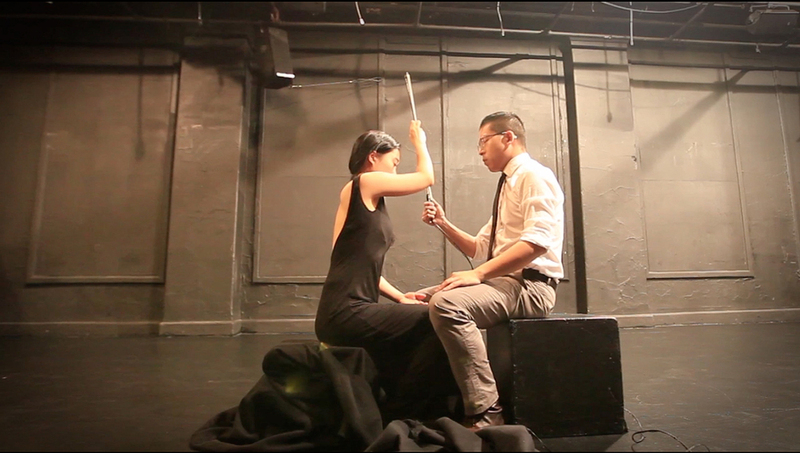 The performance began with a male performer playing my back with a cello bow, signaling objectification and submission. During the performance, I struggled with the male “cello player” and was able to thrust him off of me. After the “cello player” left, I picked up the bow and began to play myself, asserting my individual authority. “Le Violon d’Lisa” was inspired by Man Ray’s Le Violon d’Ingres, which depicted a woman in a submissive posture with the f-holes of a cello illustrated on her back. For this performance, the cello bow was threaded with a nichrome wire, turning the familiar musical tool into an interactive sensor. The bow was programmed to measure the changes in electrical voltage across my body as the male “cello player” hold the bow in one hand and completed the circuit by touching my skin. The custom bow, made conductive with the nichrome wire, was connected to an Arduino microcontroller, which detected the change in voltage. This data was passed from the Arduino to a computer via serial communication. Finally, this data was processed in Processing and sent to Max/MSP and Ableton Live to output the rich and dynamic sound. Sound is produced when the custom cello bow formed a circuit from the electric current and gathered minimum and maximum voltage data during calibration.